This lightweight blouson is very versatile. 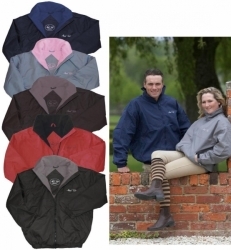 It is breathable and is suitable for riding, round the yard or just as a smart accessory. The outer is made from showerproof nylon polyester whilst the inner is warm fleece. A special feature of this jacket is the reversed fleece inner in the arms which prevents clothing rucking whilst taking the jacket off. Elasticated nylon cuffs and a high fleece lined collar helps keep the winter elements out! Features two external and one internal zipped pocket. There is an internal zip at the back of the jacket for personal embroidery purposes. The Mark Todd signature is smartly embroidered on the front and back of the jacket.